The World Ice Swimming Championships in Murmansk, Russia was honored as the 2015 World Open Water Swimming Woman of the Year. Murmansk is the largest city inside the Arctic Circle where the city administration cut open a 25m pool in Lapland Lake Semenovskoye. 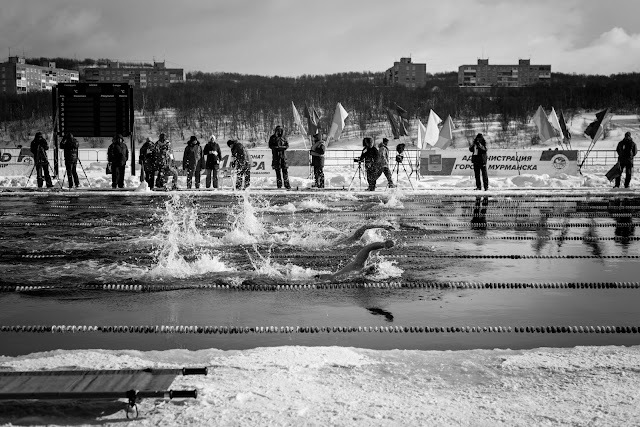 With the air temperature around Lake Semenovskoe in Murmansk at -7°C and the water temperature at 0.8°C, the event showcased one of the most dramatic ice swimming races in history when the final 1 km heat featured Germany's Christof Wandratsch, Russia's Albert Sobirov, and Estonia's Henri Kaarma [shown above]. The level of competition could not get any better with this head-to-head battle among the world's most hardy men. "It was an amazing race with stunning performances," describes Nuala Moore. "It is hard to believe the speed and the brilliance of these guys." The 1 km event also showcased the younger generation that were well-represented by sisters Renata Novakova and Iveta Novakova (Czech Republic) and Elina Makinen (Finland). Co-organizer Dmitry Blokhin of Murmansk worked hard to make the world's ice swimming community feel welcomed at such high latitudes. His hospitality and professionalism helped the city become one of the epicenters of cold water adventures. Without a doubt, the organizers from Murmansk and the International Ice Swimming Association has kicked off a grand opportunity for cold water swimmers and their fans. Safety and preparation as well as pomp and circumstance were the themes in Murmansk while the athletic performances were mindbogglingly off the charts. It has helped set the stage for an entire generation of international ice swimming exploits.